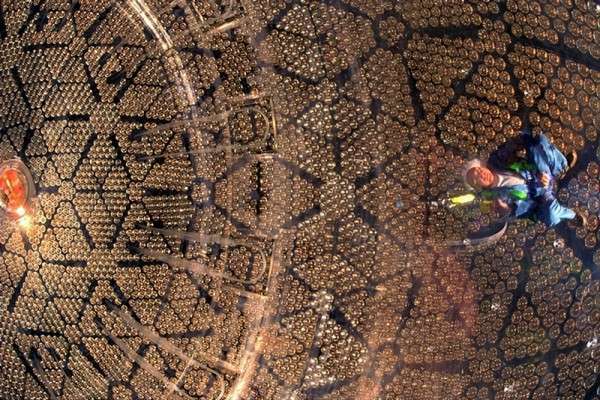 The 2015 Nobel Prize in Physics was shared by Arthur B. McDonald, the leader of the Sudbury Neutrino Observatory (SNO), and Takaaki Kajita, a leader of the Super-Kamiokande collaboration, "for the discovery of neutrino oscillations, which shows that neutrinos have mass." The discovery of neutrino oscillations and mass has profoundly affected our understanding of these elusive particles, their role in the theoretical underpinning of physics, and the evolution of the universe. The success of nuclear-physics calculations of solar energy generation has been dramatically confirmed. The discovery, moreover, opens new doors to an understanding of such basic questions as why the universe contains more matter than antimatter, and what properties a new and successful standard model must have. Neutrinos are neutral, weakly interacting particles produced abundantly in the big bang, by the sun, and by cosmic rays striking the earth's atmosphere. They have long been thought to be massless, a prediction of the standard model of particles and fields. Beginning in the 1960s, Raymond Davis, Jr. began to measure the flux of neutrinos from the sun. His experiment and subsequent ones at Kamiokande in Japan, Baksan in Russia, and Gran Sasso in Italy all found that the flux was much smaller than expected. In 1985, Herbert Chen observed that if neutrinos oscillated, they would still arrive at earth but in "flavors" undetectable in the Davis experiment, which was designed for electron neutrinos. There are 3 flavors, electron, mu, and tau, but the sun can only make electron neutrinos. He proposed a detector based on heavy water that could detect all flavors equally. The result was the SNO detector, and in 2001 SNO showed that two-thirds of the electron neutrinos had converted to non-electron flavors. Super-Kamiokande had found in 1998 a similar effect in which mu neutrinos produced in the atmosphere converted to a non-electron flavor. These conversions can only occur via a quantum-mechanical effect that requires neutrino mass to be non-zero. The confirmation of the solar-neutrino flux predictions resolved a problem that had endured for more than 30 years and shows that nuclear processes in the sun's core are understood very accurately. The discovery of neutrino mass forces a revision in our basic model of particles and fields. New theories are being developed, but a decisive choice cannot be made without more information. Experimental work to determine the actual mass (which is not given by oscillations), to answer the question of whether neutrinos and antineutrinos are the same particle, and to see if neutrinos respect a natural symmetry, the reversal of time, need to be carried out. The discovery also means that neutrinos are a part of the dark matter in the universe, but only a small part. Nevertheless, their abundance and small mass mean that they affect the form and evolution of the largest skeins and clusters of galaxies in the universe. More information: Q.R. Ahmad, et al., "Measurement of the rate of νe + d → p + p + e- interactions produced by 8B solar neutrinos at the Sudbury Neutrino Observatory." Physical Review Letters 87, 071301 (2001). Q.R. Ahmad, et al., "Direct evidence for neutrino flavor transformation from neutral-current interactions in the Sudbury Neutrino Observatory." Physical Review Letters 89, 011301 (2002). S.N. Ahmed, et al., "Measurement of the total active 8B solar neutrino flux at the Sudbury Neutrino Observatory with enhanced neutral current sensitivity." Physical Review Letters 92, 181301 (2004). B. Aharmim, et al. "An independent measurement of the total active 8B solar neutrino flux using an array of 3He proportional counters at the Sudbury Neutrino Observatory." Physical Review Letters 101, 111301 (2008). A group observed a beam of muon neutrinos from CERN and detected the tau neutrinos some of them transformed into. The results clearly show that muon neutrinos can transform into tau neutrinos. A similar group working with the Super-Kamiokande neutrino detector observed electron neutrinos from a muon neutrino beam. So we now have directed evidence of neutrino oscillation. The Weak Interaction transforms an electric charge in the diffraction pattern from one side to the other side, causing an electric dipole momentum change, which violates the CP and Time reversal symmetry. The Neutrino Oscillation of the Weak Interaction shows that it is a General electric dipole change and it is possible to any other temperature dependent entropy and information changing diffraction pattern of atoms, molecules and even complicated biological living structures.